Mamaguroove has been playing its highly infectious, homegrown, eclectic brand of revolutionary and emotional music for the past eight years. Grown from the roots of back-to-the- land-life in the Rocky Mountain wilderness of Northern BC , the ‘Guroove’ consists of a tight knit tribe, which is pronounced in their lyrics, music, and live theatrical intensity. Lyrically, their songs express a strong connection to working, raising families, and addressing social and political issues that are found both in their own backyard and the world abroad. Musically, their songs are as diverse as their influences of Funk, Reggae, Ska, World Beat, Acapella, Folk, and most importantly — Rock n’ Roll. Although individual members contribute song ideas and lyrics to the group, Mamaguroove takes great pride in arranging their tunes together as a band. Mamaguroove’s core unit consists of three family members: Shara Gustafson (lead vocals/percussion), wife of; Seth Macdonald (guitars/vocals), who is cousin to : Chris Chapman (Bass/Vocals.) These members all reside on a shared acreage in Dunster, BC (two hours east of Prince George, BC), on which they: record, practice, rehearse, and organize The Robson Valley Music Festival (held annually on the last weekend of August) on the band’s property (robsonvalleymusicfestival.com).Rounding out the groove from Prince George BC are surrogate brothers; Max Jones (Drums) and David Radies(Saxophones). Mamaguroove has three independently recorded and released albums: self-titled “Mamaguroove” (2000), “Fruit of the Groove” (2003), and most recently, “Resistance is Fertile!” released in April 2007. Songs from these albums have received airplay on CBC, CKUA, CJSR , FM 94X, CFUR, as well as other College/University and Internet radio stations across and the . Over the years Mamaguroove has endured the adversity of the road and touring life. Most notably, they have: toured extensively throughout BC and AB (approx. 40 gigs/year); completed a cross-Canada tour in 2004 (25 shows in 35 days!) and; more recently, began touring the Yukon . 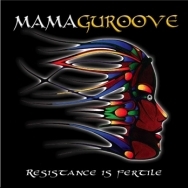 Throughout the winter of 2006/07, Mamaguroove recorded and released their long awaited third cd: “Resistance is Fertile”. With Corwin Fox of Coqi Records doing the final mix and master of the album, and with guest percussion tracks by Brent Van Dusen, the band has reached a new level of sonic expression! The “Resistance is Fertile” CD release tour was successful throughout Northern BC and Alberta , keeping the band very busy throughout the spring and summer of 2007. Having already almost sold the first 1000 copies of their new album off the stage, Mamaguroove hopes to concentrate their efforts on bringing their music to fans abroad through increased radio play and internet traffic. Stay tuned… You will be assimilated!